Please use the contact form below to request your DVD. You will also receive by email a self-help manual and articles on depression and BPD. 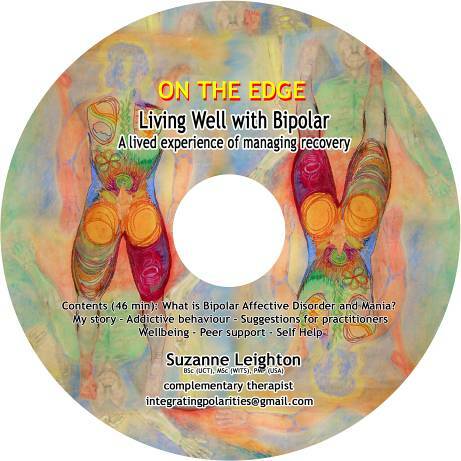 In this remarkably honest and insightful interview about INTEGRATING POLARITIES, Suzanne describes how she faced the dragon of Bipolar Disorder head-on and befriended it; moving from being a victim to a hero of her own life. She discusses her traumatic journey towards healing with a holistic approach using many varied modalities to nurture and support. Her aim is to reduce the stigma and mystery surrounding Bipolar Affective Disorder (manic depression). At present, Suzanne is running workshops to facilitate difficult conversations concerning depression, mania, self- harming and suicide, in addition to bespoke workshops on stress management, team and community building. The DVD is aimed at sufferers and their families or support people; however, it has also been well received by GPs, psychiatrists, psychologists, schools, social workers, nurses and complementary practitioners. Group Therapy: “Hero Book”: Art and narrative group workshop.